As I brave the below freezing temperatures in Maryland this week, I dream of Palm Beach. Palm Beach is beautiful, fascinating, and oh-so-chic. Lilly Pulitzer embodies chic resort style with iconic colorful prints that brighten any day. Slim Aarons captured Palm Beach chic on film. Why not brighten your home decor with a little bit of nautical and beach inspired find? This weekend, I found some chic treasures in Z Gallerie. 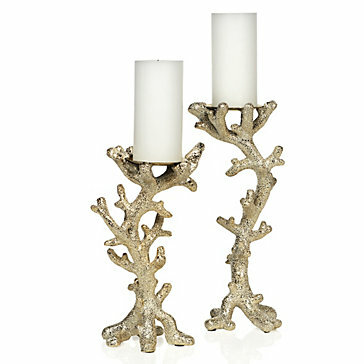 At the top of my list is this pair of coral pillar holders. The rich gold tone is elegant, making these candle sticks an excellent choice for a centerpiece. 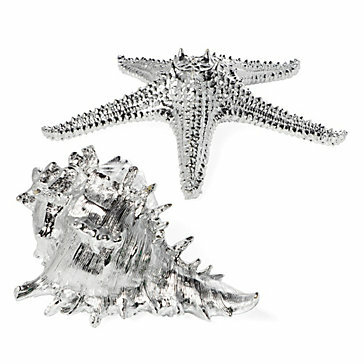 The whelk shell and starfish, made of resin and finished in electroplated silver metallic, are adorable on a coffee table or to add interest on a bookshelf. 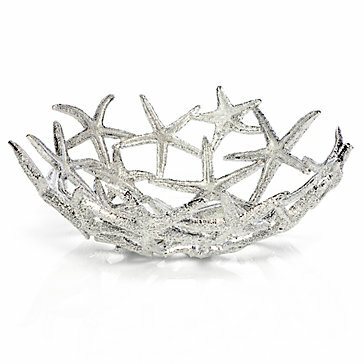 The openwork starfish bowl is whimsical and fun! I picked up one of these to display on the candy buffet table at my wedding. I'm thinking about putting little bags of cotton candy in it. 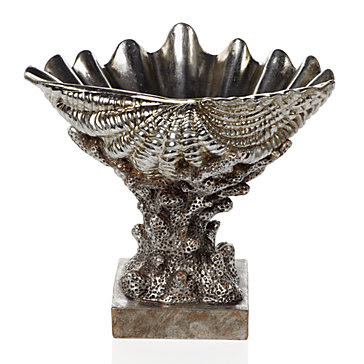 The clam shell bowl lends "Old World glamour to a contemporary context." Put this on a table in an entryway to hold keys or mail. Bring a little bit of Palm Beach chic to your home with these fabulous finds. Oh, I love all of your picks but the coral pillar holders are making me squeal with delight! They are to-die-for!! I love all of these nautical inspired home decor items! Loving those candlesticks and the starfish bowl.